Jeju Island has been named as one of the new seven natural wonders of the world on Saturday, 300 days after the nation launched an online voting campaign. 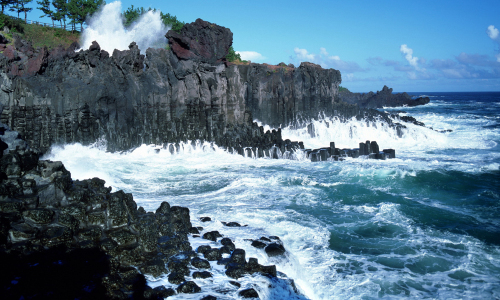 Jeju Island was one of the final 28 global candidates for “New7Wonders of Nature,” led by Swiss non-profit New7Wonders Foundation. Argentina’s Iguazu Falls, Indonesia’s Komodo National Park, the Puerto Princesa Underground River in the Philippines and South Africa’s Table Mountain. Other candidates, such as the Dead Sea between Jordan, Israel and the West Bank and the Grand Canyon of the U.S. failed to win inclusion. The results are provisional and the final results will be announced early 2012. “With the people of Korea, I congratulate Jeju Island’s being chosen among New7Wonders,”President Lee Myung-bak said on Saturday, prior to his departure for the 19th Asia Pacific Economic Cooperation summit in Hawaii. He noted that the island is the world’s only place to be awarded a triple crown in the natural science field by UNESCO — a biosphere reserve, a world natural heritage site and a global geopark. “It is more meaningful in that the selection was carried out by voting from people around the world,” Lee said. The 28 final candidates have been picked from a total of 452 candidate sites after two rounds of voting from 2007 to 2009 and screening by experts. Then, the final seven were selected through voting through telephone calls, text messages or on the Internet around the world from July 2009 to Nov. 11. The listing will generate about 1.28 trillion won ($1.14 million) worth of revenues from boosted tourism and its spillover effects, according to a report by the Jeju Development Institute. It said the listing would increase the number of foreign visitors to the island by 74 percent annually. 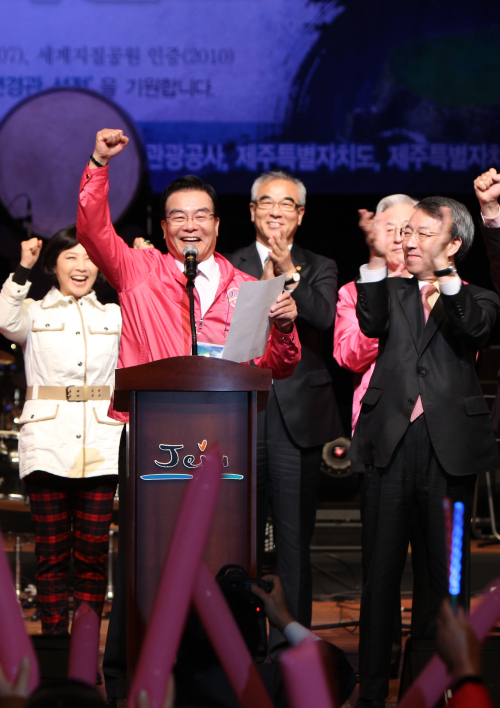 Jeju Gov. Woo Keun-min said he plans to develop new Jeju Island tourism products which can boast both the UNESCO triple crown and the New7Wonders listing. doubted fairness of the voting as plural votes were allowed. In response to criticism, Chung Un-chan, former prime minister and chairman of the National Committee for Jeju New7Wonders of Nature, told reporters on Saturday that economic benefits from boosted tourism on the island would offset the controversy over the credibility of the New7Wonders Foundation. “Other sites such as Christ the Redeemer in Brazil, which were listed as a world wonder, saw their tourism revenues increase 60 to 70 percent. Jeju’s tourism income will be greatly boosted, with other near regions benefiting from it, too,” said Chung.